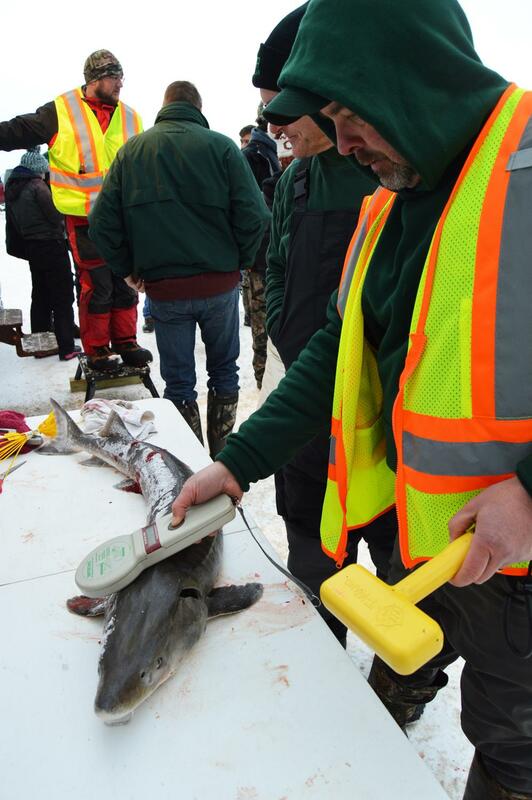 Michigan DNR fisheries biologist Tim Cwalinski scans one of the sturgeon taken during the 2019 Black Lake season to see if it previously had been tagged. This year’s sturgeon season on Black Lake (Cheboygan County, Michigan) ended at 9:18 a.m. Saturday, Feb. 2 – after only 78 minutes of fishing. The fishing season, which included spearing or hook-and-line fishing, was scheduled to run from Feb. 2-6, or until the harvest quota had been reached. This year’s allocation of sturgeon for Black Lake anglers was seven fish, although Department of Natural Resources officials set a harvest quota of six fish. Participating anglers were notified of the season closure in a variety of ways; including a fishing telephone hotline, text alerts to those who provided cell phone numbers, signal cannons, mortar rounds and fireworks. All methods were used to indicate the season’s end within minutes of the final fish being harvested. DNR law enforcement officials and other department personnel again were embedded in the on-ice fishing communities and were able to quickly report harvested fish and contact all participating anglers about the season’s close.